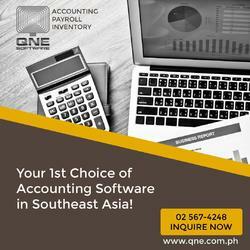 QNE Accounting software company is the first and only BIR Accounting System in the Philippines. It is tailored fit to Philippine Setting to provide local businesses the right accounting tool to manage their businesses and meet their requirements. QNE Accounting System provides business owners the ability to manage and handle their accounts timely and right, may it be a small business starting that needs simple accounting to the more complicated accounts from the established medium enterprises and corporations. The BIR Accounting System runs in a Windows based computer that comes with SQL Client / Databases and has an option to run in the Philippines’ No. 1 Cloud Accounting Solutions. QNE Accounting is not only a BIR Accounting System but a TRAIN Ready Accounting System as well. QNE Accounting System follows the latest and up-to-date mandate by the government. Making it one of the most comprehensive, convenient, and easy-to-use accounting software in the industry of software companies in the Philippines.